The 2019 NCAA Tournament is here and we all love to fill out our March Madness Bracket Contests and dominate our office pools and online brackets. In order to truly be successful you need to nail the underdogs and big upsets or what most call the March Madness Cinderella Teams to get the leg up on all the competition. Using various guides to bracketology, below is a list of our 2019 March Madness sleepers predictions. Let's face it - they all aren't gonna win or make it to the Final Four in Minneapolis, but we are hoping that a couple of them might shock everyone and become Bracket Busters for everyone except you! 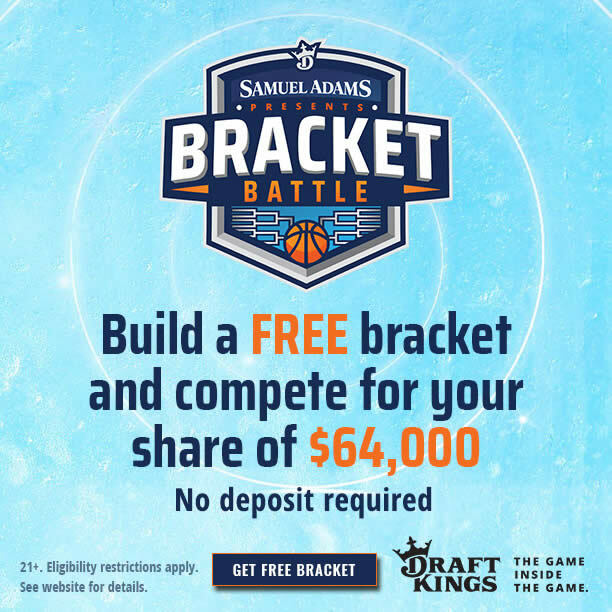 Before you take our March Madness Sleeper Picks and run, we need to tell you about the FREE $64,000 Bracket Battle going on at DraftKings (see details below). There is no commitment at all, simply join DraftKings using any of the links on this page and fill out your free bracket and you will be competing for the $64K prize money being given away! Claim Your FREE Bracket and compete for $64,000 in prize money! Below are the teams we think you should choose as the best March Madness sleepers or bracket busters. We like all 4 teams to come out of the 1st round or 2 of the 2019 NCAA tournament with one probably playing the role of Cinderella team and make it to the Final Four. Of course, we recommend you do your research and pay attention to bracket positions as matchups could play a big factor in how far they go and how many big upsets they cause.